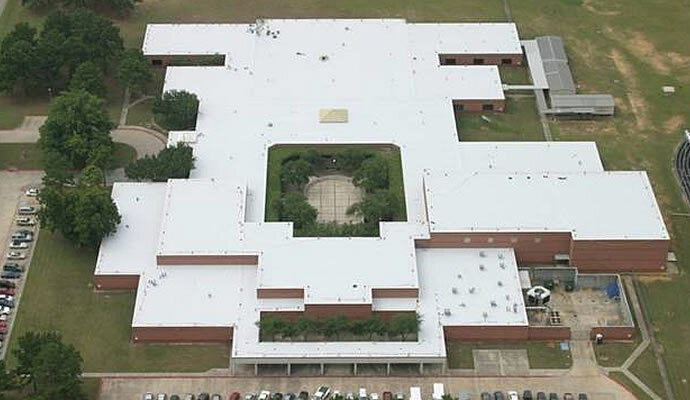 Duro-Last is a custom-prefabricated, reinforced, single-ply roofing system that is ideal for any commercial roofing application. The vinyl membrane is a thermoplastic formulation consisting of PVC resins, plasticizers, stabilizers, biocides, flame retardants and U.V. absorbents. A weft-insertion knitted scrim that is laminated between two layers of PVC film gives the membrane its strength and durability. The Duro-Last membrane is available in white, tan, gray or dark gray. can make in your building. Prefabricated. Every Duro-Last roof is manufactured to exact size in a controlled factory environment. This eliminates up to 85% of rooftop installation seaming and ensures an excellent fit that delivers long-term, worry-free, leak-proof protection. Backed by the industry’s best warranties. Duro-Last protects facilities with either a 15-year comprehensive warranty or a 20-year prorated warranty. It is transferable, has no exclusions for ponding water, and provides coverage against consequential damages that result from defects in the Duro-Last material. replacement. And here’s the best part, the warranty is included at no additional charge.